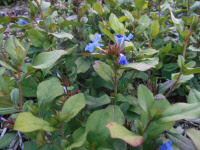 Cobalt blue flower clusters with contrasting, showy red stems and calyces in late summer and fall. Foliage turns crimson in fall – excellent groundcover. One of the most award winning plants. Plumbago is Latin meaning “lead” derived from use of the plant to treat lead poisoning. First collected by Russian botanist Alexander von Bunge in 1830 in Mongolia, then introduced by Robert Fortune who found it growing in Shanghi in 1846. “Bear a profusion of brilliant cobalt blue flowers (when) the leaves take on a distinct reddish tinge.” H.H. Thomas 1915. Rare plant. 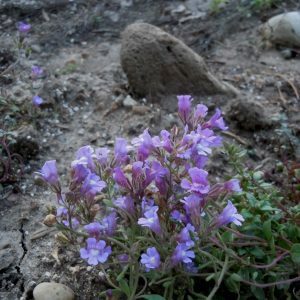 Spires of tiny purple to blue trumpets with yellow throats spring, summer & fall. Love this itsy plant. Wildlife Value: Attracts bees, butterflies and birds. 1st described in 1838. Chaenorhinum means “honey lotus” in Greek. 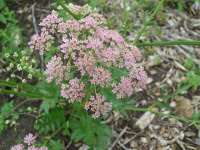 Airy rose-pink umbels like a short, pink Queen Anne’s lace, blooming in spring to early summer, compliment the fern-like apple-scented fragrant foliage. Care: sun to part shade in moist well-drained soil, cut back to refresh foliage and rebloom. Named from Greek chairo meaning “to please” & phyllon meaning“leaf.” The species collected before 1770. 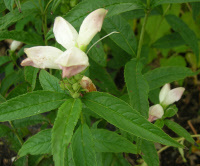 Spikes of ivory, hooded turtlehead-like flowers encircle stems in August & September. Wildlife Value: food for caterpillar of Baltimore checkerspot & nectar for butterflies. The name Chelone originated with French colonial settlers in Nova Scotia before 1700, “La Tortue,” meaning “turtle” in French. M. Dierville transported it to France along with the local name. In 1706 French botanist Tournefort adopted the Greek word for turtle as its name, Chelone. Cherokee ate boiled or fried new stems and leaves. Also used medicinally by soaking flowers in water to cure worms, skin sores, fever & constipation. Cherokee boiled roots for excess gall and soaked smashed roots to ward off witchery. Micmac & Malecite steeped the plant to make a contraceptive. Pressed specimen in Emily Dickinson’s herbarium.